You don´t have a Christmas present for yourself or loved ones? You still carry a bulky big backpack on the mountain? Now you can change that! 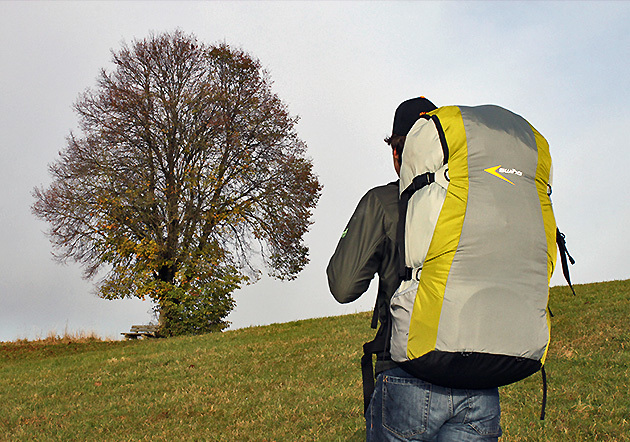 With the Everest 2 Pro Swing presents another well thought-out backpack for your equipment. With a volume of 85l and a weight of just 1,55kg it closes the gap between the Everest 2 (70l) and the Sherpa L (130l). It addresses pilots, that are looking for a highly functional backpack with very high carrying comfort and innovative features. The Everest 2 Pro was developed in close cooperation with Deuter. The result is a backpack meeting the needs of us pilots combined with the backpack Knowhow of Deuter. Of course it also features the proven and tested Deuter Alpine Back Carrying System. A special feature is the Backloader Concept. The Main Zipper runs around the back part – this way the carrying system will stay clean and dry while packing your equipment. Once you got your glider, harness and helmet inside you can fill the remaining space from the side (additional zipper) with your jacket, gloves, food, etc. Then you compress the contents with the compression straps and off you go on your tour. Because of the exceptional carrying comfort you will be able to enjoy your (mountain) tour to the fullest. Many smart details make it possible to adjust the backpack to meet your individual needs. E.g. you have the possibility to attach outside pockets, a helmet net, hiking sticks, ice axe or other pieces of equipment. Along the back part you have room for your drinking system as usual – to satisfy your thirst also while walking. Of course you can combine it with all the popular and well-known accessories from Deuter, like the rain- or transport cover. The Everest 2 Pro offers a volume of 85l at a weight of just 1,55kg. An equipment consisting of an Arcus 7, Connect Light, helmet and overall will easily fit inside. With the right packing technique it is even possible to carry an Astral 7 and a Connect Race (incl. reserve) to any mountain top.